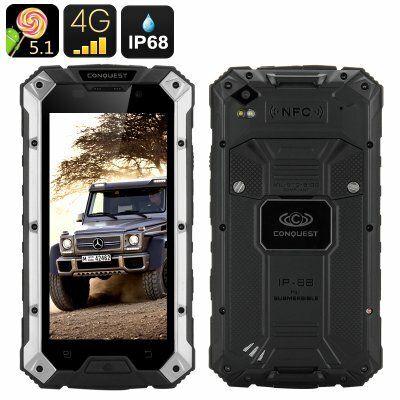 Successfully Added Conquest S6 Pro Rugged Smartphone - 5 Inch Screen, 4G, Android 5.1, 3GB RAM, 6000mAh Battery, Bluetooth 4.0, NFC (Silver-Black) to your Shopping Cart. The Conquest S6 is a sturdy rugged smartphone with 4G connectivity, dual SIM support, Android 5.1 operating system and lots more! The 5 inch smartphone is well-protected against the elements with the IP68 rating and comes with a large 6000mAh battery. The Conquest S6 is a tough smartphone that can even be submerged in water for up to 30 minutes. Protected against water, dust and shock, it is a reliable smartphone that is meant for the great outdoors. With the Conquest S6, you will be able to enjoy great connectivity thanks to 4G support on two SIM cards. With 64GB of internal memory, you will have lots of built-in storage space. The MTK8752 Octa Core processor and Mali-T760 GPU will provide the perfect platform for gaming and multitasking. Plus, the 5 inch HD screen is perfect for watching movies, browsing the web and working with apps. Thanks to Android 5.1, you will also have a nice intuitive interface and access to the Play Store. The rugged smartphone features a 6000mAh battery, giving you about 16 hours of non-stop talking time and a whopping 700 hours on standby. With NFC support, you will have quick and efficient data exchange on the go and OTG guarantees easy wireless software upgrades. The Conquest S6 Rugged Smartphone comes with a 12 months warranty, brought to you by the leader in electronic devices as well as wholesale Android Phones..